The sun is shining once again over Wimbledon and St John Ambulance is encouraging spectators to stay safe in the sun by being aware of a few simple steps. The high temperatures are already keeping the 43 volunteer first aiders, nurses and doctors very busy providing assistance to the 39,000 people who enter the grounds daily. It’s easy to get caught up in the excitement of the event and not recognise the risk from sunburn and sun-stroke. NHS choices recommend staying out of the sun between 11am and 3 pm, perhaps not always possible during the event. In which case they recommend you plan ahead and take steps such as having enough cold drinks to hand, wearing a hat and ensuring sun block is reapplied regularly. 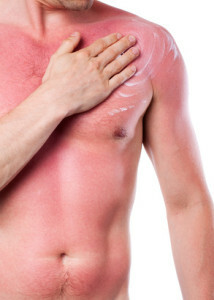 Sun burn, heat stroke and heat exhaustion are caused by being exposed to the sun for too long. Recognising the symptoms for yourself and those around you allow you to act quickly to get help. Visit St John ambulance for more information about the effects of heat and Public Health England’s heatwave plan 2014 also has advice on how to cope during a heat wave. You might also visit our Sun Safety and Skin Cancer forum and talk with others. There is also some information about melanoma and non melanoma with details about symptoms and treatments.